A couple of my classes are already through Episode 5 and are looking forward to Thursday's new episode, but most of my classes are still on Episode 3, working on their second exercise of their formal writing. I don't have anything shockingly new to report, but I do have a few quick observations and reiterations. 1. The students really like the projected transcripts, and so do I. We sit in a semi-darkened room and read the story together on the big screen while we listen to the podcast. It's so good for their reading comprehension, and it's really helping them focus on their listening skills. But I think they like literally "being on the same page" as their friends, and sharing a story communally. I have never asked them to read the transcripts, and not all of them do -- but a surprising majority of them voluntarily read and get mad at me if I forget to scroll down. 2. As before, I love how accessible the podcast is. If a student goes on vacation or "home hospital," it's so easy to email them a copy of the exercises and let them keep up on their own. 3. With her "Zoom" structure of telling the story with a widening viewpoint, the kids have a chance to consider themes at different levels -- a hallmark of literature. I do miss the characters of Season 1, and trying to figure out who's lying and when and why, but ultimately this season feels much wider and deeper, and I think it's going to prove to be more profound. For this particular episode, we're working on turning our notes into an essay, and then making our essays "half as long" (in the spirit of A River Runs Through It), and then half as long again, to intensify our writing. Once we have our intense summaries, we compare them to Koenig's more expansive writing and consider "art as an inspiration for empathy" -- it's making for some great classroom discussions. - 24 of the 26 CCSS anchor standards are addressed in the third episode alone. I think the only standard the bundle is missing is the one about using technology to publish a document, and any teacher can easily take care of this on their own. - The bundle includes three healthy lists of vocabulary, three quizzes, about 15 stand-alone lessons, a few ELA lessons that will help with any text (not just Serial), several writing prompts, plenty of discussion prompts, and about a billion timestamps to help anybody navigate the podcasts. - The first person this is going to help is me. Normally I would scribble down timestamps and prompts and then misplace them. Now I have them in one spot, and about 20 worksheets ready to print out. It's going to be a great January. - I'm also going to have some days with substitute teachers coming up (conferences I'm speaking at, etc. ), and it's so relieving to know that everything is already written out for them. - I'm also really proud of my wife, soulmate, and graphic designer (all one person!) for making these worksheets look waaaaaay better than I could ever make them on my own. She's also a pretty good editor for when I start babbling or assuming more than I should. - I also like the fact that our lots and lots of hours of work will save so many hours of work for other teachers. 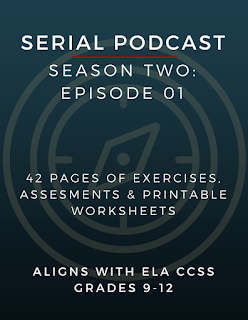 Serial Podcast Lesson Plans (for Season 2) are now ready for Episode 2! The plans for Episode 2 are all finished, and I can't wait to put them into action! I might have done a little bit too much front-loading (there are seven exercises, a game, and a quiz), but it should make for an trouble-free, totally fun January. I'm proud to say that 19 of the 26 anchor standards are addressed in this unit alone, and I'm pretty confident this season of Serial will be as interesting as the first season (if not more). 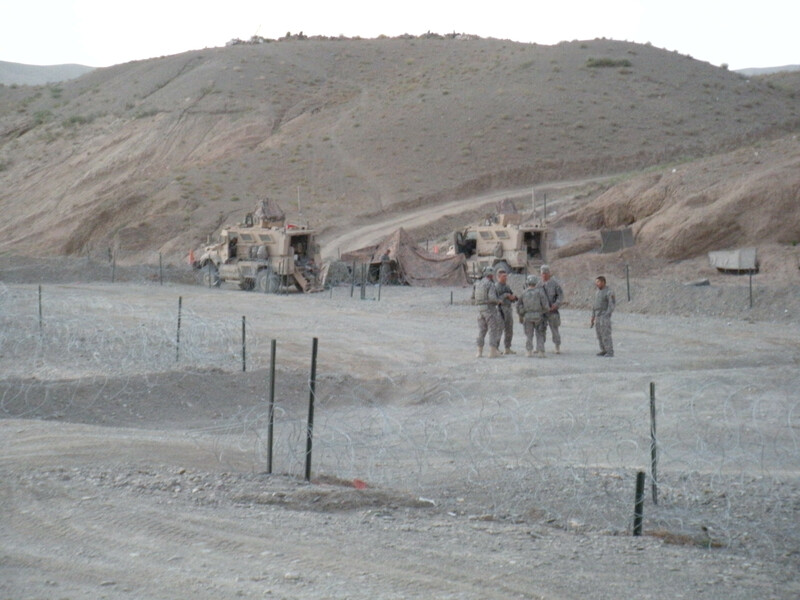 I've already done some of the pre-writing exercises with my Criminal Justice class, and they were giddy to hear the story of Bowe Bergdahl. Of course, I can't use a majority of my lessons with this class (since they're designed for ELA), but some are pretty applicable, and it just feels great to have timestamps for all the crucial quotes, a few naughty words, and the challenging vocabulary. As usual, the 47 pages of resources (and 30 hours of work) is available to the public at our TpT store, where you can also find the first episode and the third episode (soon!). And, of course, you can also find the 300-something pages of lesson plans and resources on the first season of Serial. And as always, feel free to ask questions and give feedback to what you think of the podcast, and how it's working in the classroom! Thanks to the help of my talented wife Melissa, the lesson plans for the first episode of Serial (Season 2) are now available. The unit contains 42 pages that include 6 exercises, a quiz, printable worksheets, vocabulary words, and engaging prompts. Best of all, there are lots of timestamps so you can keep track of key scenes, vocabulary words, naughty words (there are two little ones), and the general form of Sarah Koenig's storytelling. Feel free to send me reactions, comments, or ideas for improvement. Otherwise, enjoy! When it comes to poetry readings, I firmly believe that 95% of the common ones just bore the entire audience, while the other 5% completely engage everyone's complete attention. I will always remember how Maya Angelou completely owned an entire gymnasium for an entire hour before everyone just sort of floated out into the parking lot. At Cal Poly, everyone hung on every word of Sekou the Misfit; and in Boulder, everyone in the super-cool, totally apathetic coffee shop would suddenly stop talking and stop drinking whatever they were drinking when Glenn Hergenhahn took the stage. Last week, Will Jones had one of those unforgettable performances. 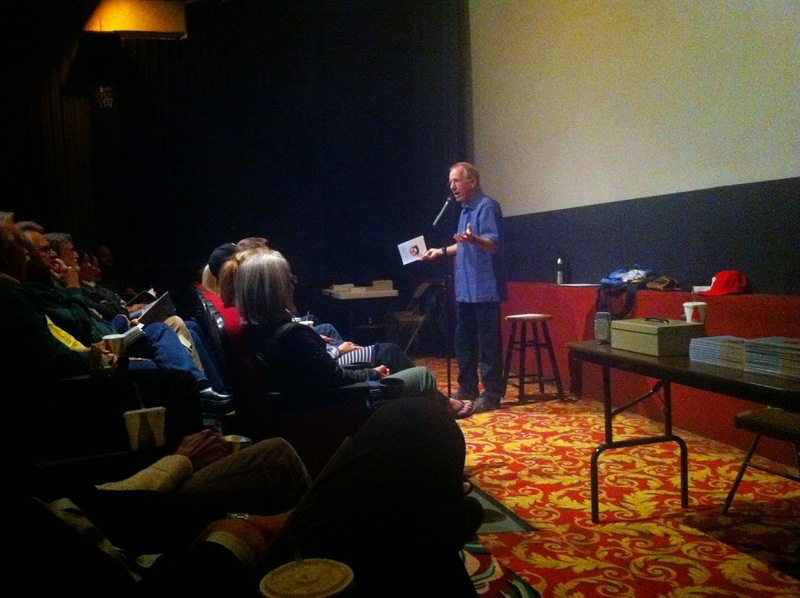 He packed the the room at the Palm Street Theater, and had everyone laughing, and feeling, and sharing in the communal experience of life. The audience's appreciation of his words was evident—like the cases I mentioned above, I don't think a single person missed a single word. Will was a role model of mine when he was a principal at SLO High (where I taught English). Now, he's a role model in retirement. It seems every week, he's climbing a large mountain or publishing an article. 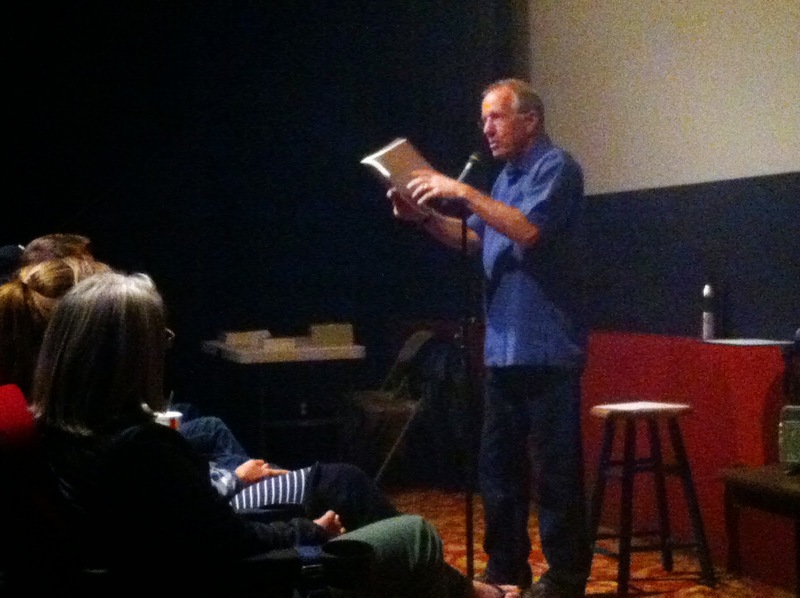 This poetry reading was a perfect example, one where he explicitly announced: "This is how you do retirement!" He had all the bravado and personal excitement of somebody running down their bucket list, but he balanced it with a humorous humility, exemplified when he proudly announced that we could buy a signed copy of his book, and then immediately admitted with a big smile, "I have no idea who I think I am." The poetry itself was a great lesson on how to look at, appreciate, and reflect on life. The poetry reading was a great lesson on how to actually live life. More of this, everybody. More of this. P.S. Will wrote on his Facebook page, "True Stories from My Past Volume 2, is now available online at Half.com. Go to www.Half.com and enter the title or the ISBN, 9781495146138, to order a copy. I will mail it to you personally." 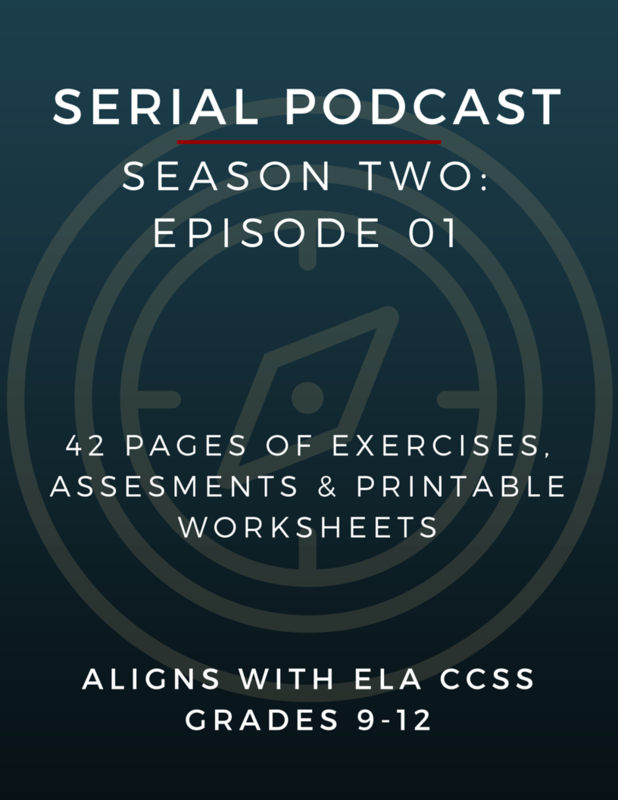 Creating our own "Serial" podcast of "The Crucible"
A few months ago, I published some very thorough lesson plans for using the Serial podcast in the high school classroom, and in the final unit, I suggested helping students create their own podcast. It's project-based, it's fun, it's using technology, and it's a great summative assignment. Then KQED's Mind/Shift did a feature on our class that included our plans to re-tell the story of The Crucible in a short podcast. So teachers have been emailing me and asking: How did it go? The short answer: It went great. The kids were engaged, they were driven by an authentic goal, they had fun, they were creative, and they were collaborative. On my end, it worked as a excellent summative assessment—it was very clear which students understood the finer points of The Crucible and the structure of Serial, and which ones did didn't have the same handle. The longer answer: It took much longer than I thought it would. I should definitely know better, but I somehow thought that we could analyze Serial's structure, read The Crucible, and then just ask them to put the two together. In reality, they needed a lot of scaffolding, and many groups needed my guidance at every step. As it is, we're still not done. Even the sample I'm going to include on this post is unfinished—they want to add music and sound effects, and they'd like to re-record their voices. As briefly as I can, I'll take you through the steps, and I won't be shy about telling you where things got difficult. And, of course, you can do this with any text, not just The Crucible. Step 1: Analyze the form and structure of the pilot episode of Serial. This is one of the fundamental lessons in my published unit, and it breaks down all the elements of classic story-telling (the hook, the introduction, characterization, plot, etc. ), and it asks students to study how much time is dedicated to each element, what order they're in, the tone of each segment, and so on. They write this down on a giant timeline in their journals. This takes at least an hour to actually physically write (the episode is almost an hour by itself), and many of the students needed help identifying the various elements. It certainly helped to do it in groups, but even then, they needed my help. Step 2: Read The Crucible (or any text). For example, I've heard a couple teachers mention Hamlet. In any case, with their recent analysis in mind, the students are primed to explicitly note the story elements in whatever text they're reading, and should map out a similar timeline. Several good class discussions came from comparing and contrasting the form and structure of the two stories. Also, we were surprised and delighted by the some similarities in the stories themselves (they both have mysteries, liars, betrayals, court scenes, and even forbidden dancing in the opening scenes). Step 3: Consider how to tell one story in the form of the other. Along with some direct instruction and advice, I also showed them SNL's very funny re-telling of "Kris Kringle" in the form of Serial. I honestly thought that would be enough, and maybe for some classes, it would be. But my class (11th grade English) needed a little more scaffolding. For each aspect of the story, briefly summarize how Sarah accomplished that part, how your group accomplished that part, and how the two versions compare (Are they similar or radically different? Is one better than the other for a particular reason?). Observations about a psychological or deeper truth. Description of the crime and the victim. Step 5: Determination of group roles. This might happen before Step 4, but in any case, each group (usually no more than four students) had to decide how they're dividing their labor. They should explicitly write this down for your assessment purposes and also to hold them responsible for their individual expectations. Some groups divided the writing into segments, while others had a "reading expert" and a "creative writing expert" and so on. Step 6: Write the draft. This is what took far longer than I expected. The more people in the group, the longer it takes. There were some two-student groups that finished this in an hour, but the bigger groups took twice as long. There are just lots of brainstorming, discussions, arguments, and compromises (which are all great things, but time-consuming). Emphasize that these podcasts shouldn't be any longer than 5-6 minutes. Step 8: Groups get feedback. This can come from you and/or the other classmates. My former AP classes were very generous with their friendly, constructive feedback; my "college prep" kids are a little more shy. Step 9: Create final draft, based on feedback and reconsiderations. Step 10: Record the podcast using Audacity. They just did this in another classroom (our digital photography class), and technically speaking, this should only take 10 minutes. In reality, I sent one "pioneer group" first (their sample is included below), and it took a lot longer than that. First, they all shared a microphone and didn't like the sound. They decided to re-do it the next class using four different computers with four different microphones, but the teacher re-directed them to the Mac in a smaller, secluded room, which seemed to work fine. But they still don't love their voices, their pauses between lines was intentional but ultimately bad for the listening experience, and they still need to include music and sounds. But now it's Spring Break, so we'll have to wait another week or two.